A110-10 TWY 'P' ENDS AT GATE #5. A110-13 FLOCKS OF BIRDS ON & INVOF ARPT; FQT SEAGULL & GEESE & DUCK POPULATIONS AIRBORNE OVER ADJ RIVER AREAS. A110-14 TRNG FLIGHTS THAT INCLUDE MULTIPLE APCHS AND/OR TOUCH & GO OPNS REQUIRE PRIOR PERMISSION FM THE ARPT MGR. A110-17 LEFT-HAND TURN-OFFS FROM RY 33 TO TWY 'K' PROHIBITED. A110-19 ACFT ARRIVING/DEPARTING THE GA PARKING AREA ARE PROHIBITED FM TAXING BTN ACR PUSHBACK OPNS & THE GATES. A110-21 BE ADVISED SOME AIRCREWS MISTAKE RY 15 FOR RY 19. A110-24 ASDE-X IN USE. OPERATE TRANSPONDERS WITH ALTITUDE REPORTING MODE AND ADS-B (IF EQUIPPED) ENABLED ON ALL AIRPORT SURFACES. 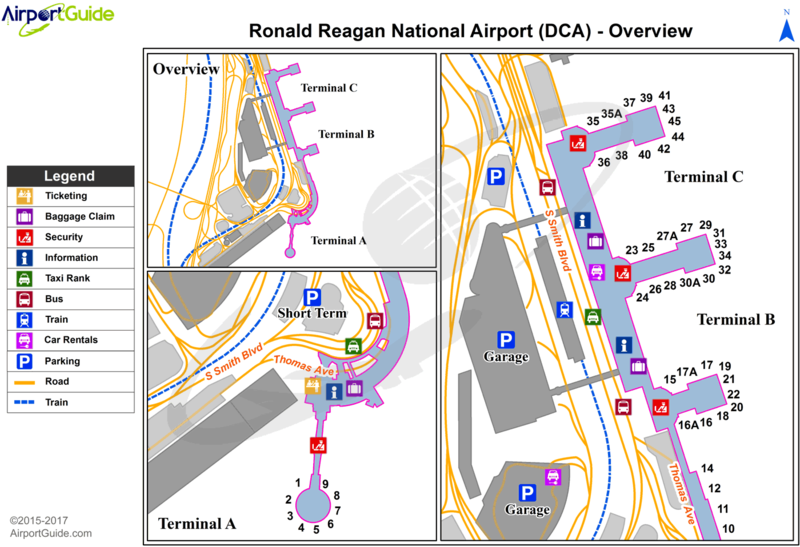 A110-25 RONALD REAGAN WASHINGTON NATIONAL ARPRT (KDCA) IS AN EMERGENCY USE ONLY FIELD FOR ALL DOD OWNED AND OPERATED ACFT. A110-3 LGTG FM VEHICLE PARKING LOT LCTD 1000 FT SW OF RY 01 COULD GIVE FALSE INDICATIONS OF BEING PART OF RY 01 APCH LGTG SYS DURG PERIODS OF REDUCED VSBY & LOW CEILINGS. A110-5 FORM 150R CREDIT CARD FOR ALL RQRD SVCS. NO MIL FACS. A110-7 HOLD BLOCK FOR RY 04 CLSD FOR ACFT PARKING 2100-0830. A30-19X THIS RY EXISTS TO SUPPORT THE DCA LDA ASSOCIATED WITH THE ILS. A43-15 RWY 15 PAPI UNUSBL BYD 3 DEGS L OF RCL. A43-19 RWY 19 VASI (V12) CONSISTS OF TWO (2) VASI-V6 SYSTEMS (L/R). 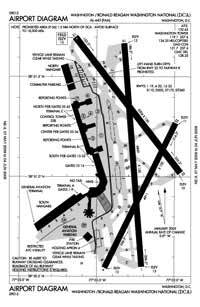 RWY 19 V6R IS ROTATED 20 DEGS TO R AND EXTDS COVERAGE TO 24 DEGS R OF CNTRLN. THE ROTATED VASI-V6R SYSTEM SUPPORTS VISUAL AND INSTR APCHS TO RWY 19. A56-04 THREE OBSTRUCTION LGTS POLES--ONE 600 FEET LEFT, ONE ON CENTERLINE, ONE 600 FEET RIGHT. A58-15 RY 15 +8' BLAST FENCE 120 FT FM AER 250 FT RIGHT. A58-19 +10 FT BLDG (L/M) +120 FT FROM AER 300 FT LEFT. E111 RWY 06 +53'FT TREES 175'R @THLD. E60-04 ENGINEERED MATERIALS ARRESTING SYSTEM (EMAS) 336 FT IN LENGTH BY 170 FT IN WIDTH LCTD AT THE DER 04. E60-15 ENGINEERED MATERIALS ARRESTING SYSTEM (EMAS) 142 FT IN LENGTH BY 170 FT IN WIDTH LCTD AT THE DER 15. E60-33 ENGINEERED MATERIALS ARRESTING SYSTEM (EMAS) 332 FT IN LENGTH BY 170 FT IN WIDTH LCTD AT THE DER 33. Single Wheel Landing Gear: 110.